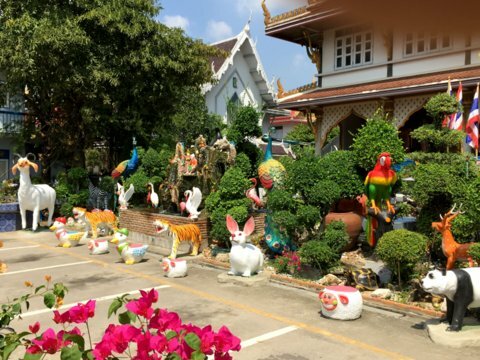 Wat Lan Boon is located on the banks of the Prawet Burirom Canal in Lat Krabang district in eastern Bangkok on the outskirts of the city.The temple is a fish sanctuary that’s popular with visitors. 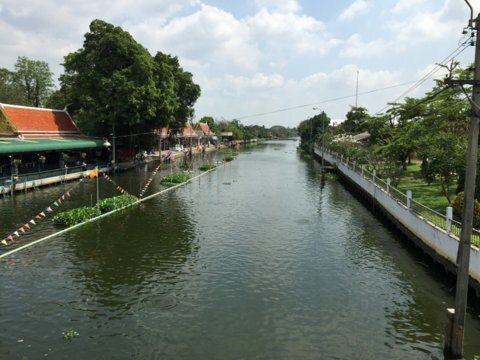 The Prawet Burirom Canal starts from the Bang Pakong River in Chachoengsao to the east of Bangkok and flows for about 33 km where it joins the Phra Khanong Canal near Sukhumvit Road. It’s one of the few remaining canals left in a city that used to be famous for canals. What’s more, it’s relatively clean compared to some of the canals in the city centre. 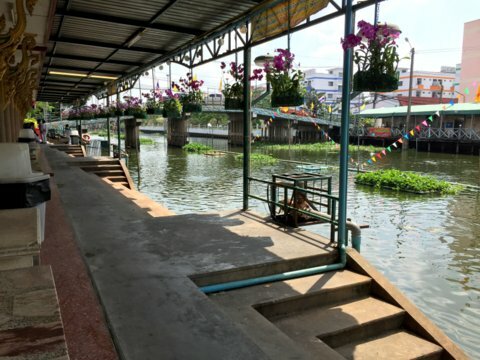 There are many old attractions along this canal like the Hua Takhae Market, the Luang Phaeng Market to the east and further east the Khlong Suan Roi Pi Market that straddles Samut Prakarn and Chachoengsao. Wat Lan Boon is located on the northern bank of the Prawet Burirom Canal in Soi Lat Krabang 1. 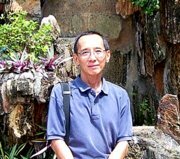 Temples in Bangkok are usually noted for their architecture, large Buddha images, beautiful murals and even legends. 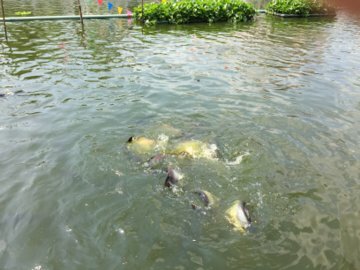 But Wat Lan Boon is known for its fish sanctuary in the Prawet Burirom Canal. An arched bridge over the Prawet Burirom Canal leads to the temple. 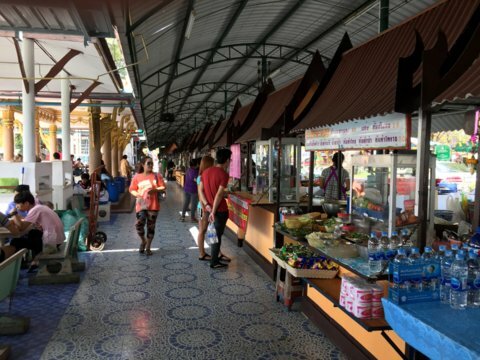 The Fish Garden is to the right; this is one of the few temples with food vendors housed in permanent pavilions. The vendors are open every day. 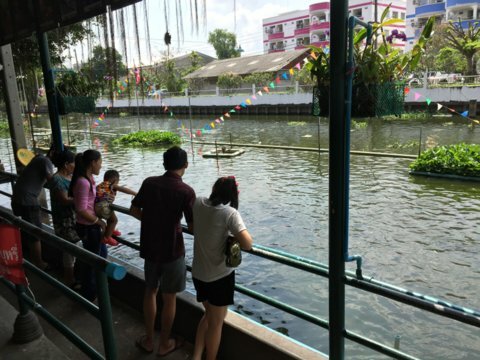 Visitors dine on tables by the canal and feed the fish later. Both belong to the family Pangasidae, a species of catfish or shark catfish. These fish have dorsal fins closer to the heads giving them the appearance of a shark. 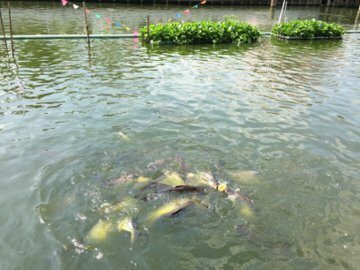 They are fresh water fish found in rivers in South and South-east Asia, like the Mekong. 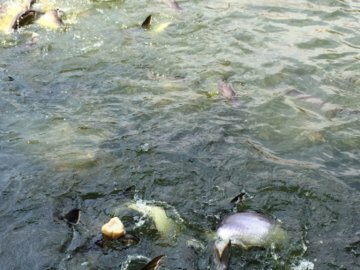 Take a look at this video to see the shoals of huge fish surfacing in a feeding frenzy. 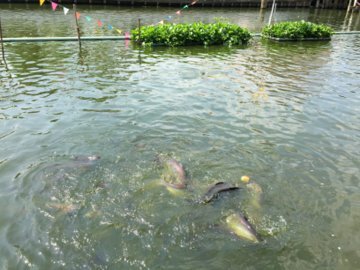 The fish sanctuary is a favourite with families who come here to pray, make merit, have a meal and feed the fish. 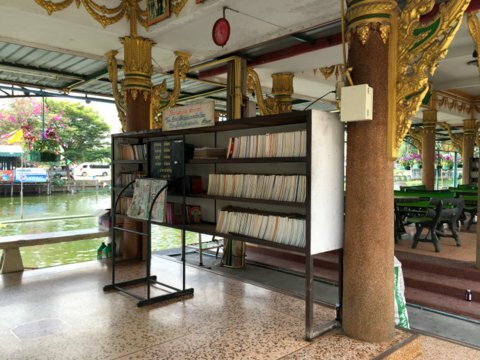 There’s a library housed in the open pavilion along the other end of the canal and also a resting place for visitors. You can feed the fish at this end as well. The atmosphere here is peaceful. There weren’t very many visitors on a weekday; it’s busier at the weekends. There was a prayer session in progress in the late morning during my visit. I took a tour of the temple grounds and these were some of the pretty scenes I encountered along the way. 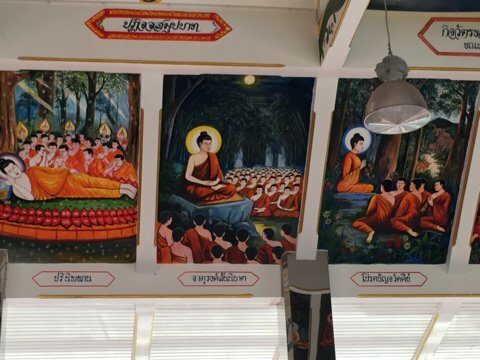 These colourful murals in the multi-purpose hall caught my eye. 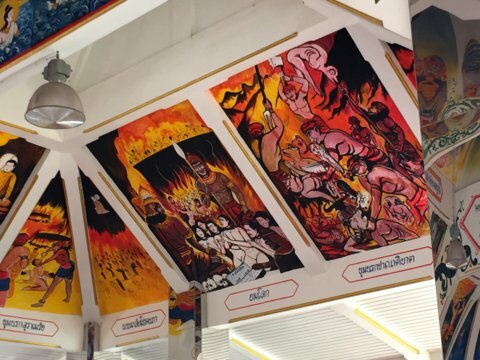 On a closer look they depict scenes of Buddha’s life and also the horrors of hell. Wat Lan Boon is a community temple with the Wat Lan Boon community living behind the temple, a childcare centre and a school, the Wat Lan Boon School located near the temple. Like most temples there is a crematorium within the temple grounds and vaults for people to store the ashes of the deceased who are likely to be members of the community. It’s a very local and non-touristy place, peaceful and pleasant way to spend a quiet morning by the canal feeding the fish or just relaxing. Here’s a satellite map of Wat Lan Boon showing the location of the main attractions. The map below shows the location of the temple on the Prawet Burirom Canal and how to get there. If you are coming from the city, the easiest way to get there is to take the Airport Rail Link to Lat Krabang station, that’s one station away from Suvarnabhumi Airport. 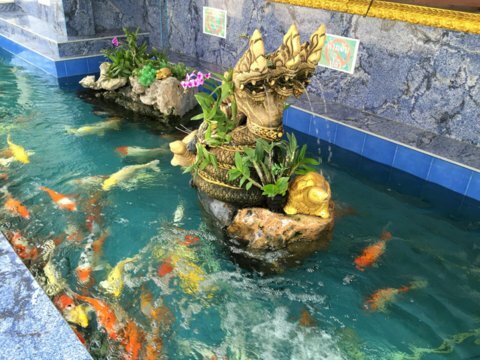 From there take a taxi, tuk tuk or motor cycle to temple in Lat Krabang Soi 1, Soi Sukhumvit 77 (Soi Onnut). If you are driving, go along Sukhumvit Road and turn into Soi Sukhumvit 77 (Soi Onnut) near the Onnut skytrain station. Keep going till you get to Lat Krabang Soi 1. The temple is open every day from 8 am – 6 pm. Admission is free.